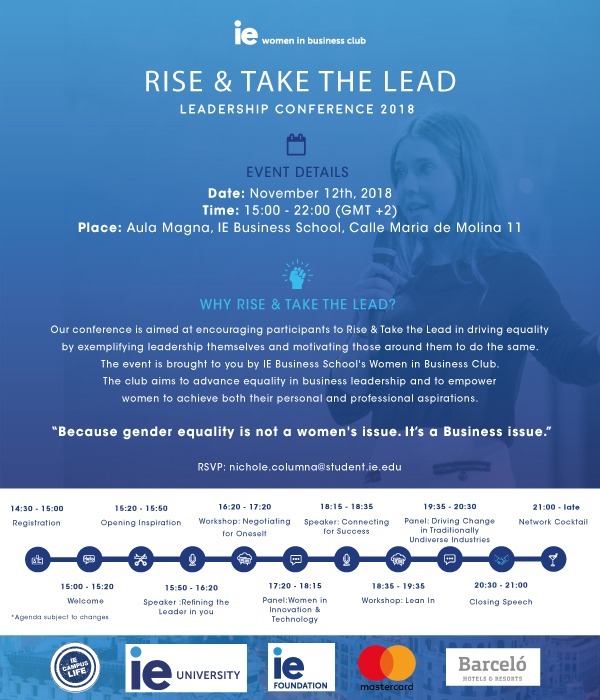 The Conference “Rise and Take the Lead” is organized by the IE Women in Business Club and powered by The American Chamber of Commerce in Spain, IE Center for Diversity, Hotel Barcelo Emperatriz, Master Card and IE Campus Life. IE Women in Business Club invites you all to take part in its annual Leadership conference: visit the website with all the information. The conference is aimed at encouraging participants to drive equality, both taking the lead themselves and motivating those around them to do the same. Guests will learn how to adopt a ‘Lean In’ bias, practical negotiation and mentorship skills, how to refine the leader within themselves as well as how professionals in traditionally non-diverse industries have driven the change in their careers. Speakers: Santiago Íñiguez, IE University Executive President ; María Benjumea, South Summit Spain ; Beatriz Faro, Pfizer; Elaine Do Amaral, Telefónica ; Maria Jose Barrea Rojas, L’Oréal ; Patrick Jephson, JephesonBeanman Consultancy ; Eduardo Dávila, Aon Iberia & Middle East ; Zara English Janmohamed, Loftus Bradford; Cristina Magdalena, Fujitsu Spain; Cristina Aranda, MujeresTech; Marieta del Rivero, International Womens Forum Spain ; Blanca Ferrero Rodríguez, MasterCard; Susanna Rodriguez, Oracle; Marisol Quintero, Bioncotech Therapeutics ; Juan Picon, Latham and Watkins ; Chantal Gamo, EY ; Ana Muñoz, International Womens Forum. The event is brought to you by IE University’s Women in Business Club. The club aims to advance equality in business leadership and to empower women to achieve their professional aspirations. Because gender equality is not a women’s issue. It’s a business issue. Award winning professional with over 20 years working experience in the commitment to internal and external customers. Able to find solutions and new ways of managing when needed with both internal and external teams, using not only the knowledge and experience gained at work but also high doses of creativity and adaptability in a world of constant change. Frequent reader and traveler having visited over 25 countries. Academic credentials include an Executive Master in Communications at IE University and a BA in Linguistics. Education, tourism and arts are my main areas of professional development in English, Spanish and French entrepreneurial ecosystems.